RBTH offers a mini-guide to the most famous names in Russian classical music – from Mikhail Glinka to Alfred Schnittke. 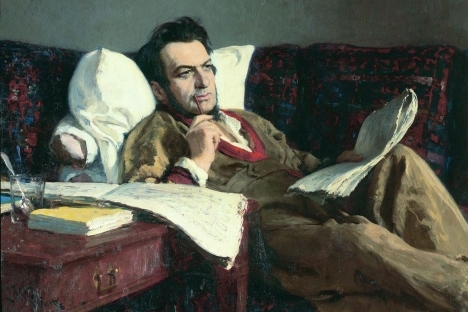 Russia’s composers have gained a permanent place in the history of the world’s classical music. Some laid down the rules of composition, while others smashed those rules. Still others preserved Russia’s folkloric music in their pieces, or re-imagined medieval music. Some have even sought to define the music of the future. Glinka’s unique position among Russia’s composers is due to his being hailed as the founding father of the Russian school of classical music. He began making music when he was only 10; he was already composing by the age of 18. In his youth, he gained fame as a pianist and singer with an angelic voice. Fame as a composer came only in his 30s. Contemporaries recalled that he was highly opinionated and valued only his own work amongst other composers, along with works of Glück and Chopin. He was a friend of the poet Pushkin, and Glinka wrote his opera “Ruslan and Ludmila” on the basis of Pushkin’s poem of the same title. The opera earned the ire of Russian critics, but it was admired in Europe. It is a masterpiece that continues to preoccupy opera-directors – when the Bolshoi Theatre reopened in 2011, Glinka’s opera opened the rebuilt Main Stage in a provocative production. After the implosion of the Soviet Union, Glinka’s “Patriotic Melody” – written in 1833 – served as Russia’s national anthem until 2000. The genius to-be was the son of an engineer at a metal plant deep in the Russian provinces. Later, Pyotr moved to St. Petersburg, where he studied as a lawyer and got a job at the Justice Ministry. Music was just a hobby for him for many years, but he eventually quit his job for it – “and swapped it for the tin-whistle,” as he said at the time. Tchaikovsky’s works were long considered second-rate, but he was later given an honorary degree by Cambridge University, “in absentia.”The composer himself modestly said that the public was over-indulgent toward him. Yet that same public judged not only his music but also his homosexuality. Tchaikovsky’s sudden death from cholera was long thought to have been suicide. Rimsky-Korsakov was one of the most respected and talented music professors of the 19th century – he originally graduated from the Naval Academy, but devoted his whole life to music. The summit of his achievement was the completion of his 15 operas, which were mostly composed to stories of Russian history and fairytales. He studied Russian folklore with great fondness and used it, where possible, in his works. Many events in his life are connected with his teaching career at the St. Petersburg Musical Conservatory. He had long refuted the need for composers to undergo musical training, before becoming a professor himself. From behind a desk, Rimsky-Korsakov tasked himself with completing gaps in composers’ musical history. “It’s my hope as a professor to make my position unnecessary!” he declared to his pupils – among whom was a young man named Sergei Prokofiev. Despite initial career intentions for the army, Mussorgsky sang well, played the piano, and was eventually won over by the desire to make music. Not all of his compositions reached completion, due to the fact that he preferred to write scores “straight to the finish,” without making draft versions. Many of his works – including his opera “Khovanschina” – were completed or reworked by other composers, including his friend Nikolai Rimsky-Korsakov. The ballet impresario Sergei Diaghilev wrote in his memoirs that Mussorgsky was rarely taken seriously as a composer during his own lifetime. He was often employed at the opera theatre as a rehearsal pianist and was paid 25 rubles per rehearsal. Critics – with few exceptions – gave the coolest of receptions to Mussorgsky’s works. His health was wracked by addiction to alcohol, and he died at the age of 42. Acclaim for his work came only after his death. Rachmaninoff was a world-famous pianist and conductor – often called “the most Russian of composers,” despite having lived in the United States for 26 years. Rachmaninoff was born into a wealthy noble family that was known for its musical talent. He even studied for a number of years with Tchaikovsky. He produced his first opera at the age of 19, among many other works. He went through a difficult creative block in his youth, after which he was able to realize his abilities on the fullest scale. Following the Russian Revolution of 1917, Rachmaninoff emigrated to the United States, where he remained for the rest of this life. During his life as an emigré he gained world-renown. He claimed that he was “85 percent musician, and only 15 percent human”. His famously large hands could span an octave-and-a-half on the keys. People often said he had a golden heart: during World War II he personally paid for the construction of an aircraft for the Soviet forces. Stravinsky’s creative output encompassed the development of neo-classicism as a new musical genre of the 20th century. His active touring career, unwillingness to be repetitive, and ability to write in numerous genres separate Stravinsky’s muse from that of other Russian geniuses. He was a lawyer by profession and had studied with Nikolai Rimsky-Korsakov. Stravinsky was a composer, pianist, conductor, and a patriot. Enthusiasts found his Russian roots throughout his compositions – despite the fact that he spent 57 years outside Russia. He is alleged to have had an affair with Coco Chanel – but the composer himself downplayed such rumours. His final masterpiece – his “Requiem” – was written when he was already 85. He passed away of heart failure. Shostakovich was a legendary Soviet-era composer whose works continue to feature among the most frequently-performed in the world. Shostakovich had been in the crowd to hear Lenin’s public addresses, even as a toddler. After his father’s death, he earned some much-needed income for his family as a pianist for silent films. He came back to the cinema quite soon, writing the soundtracks for more than 20 Soviet-era films. Fame came early at 21, when his “First Symphony” was played in both Germany and the United States. He struggled against Soviet censorship throughout his life – perhaps the reason that, as his contemporaries said of him, he was almost never seen smiling. Prokofiev penned his first operas when he was only 9 or 10. Later he would become famous for his musical innovation and achieve international fame. Prokofiev was a great chess-player and also a Protestant, although he preferred not speak about the latter. The composer’s first wife – a Spanish girl named Carolina Codina – was imprisoned in a Soviet labor camp for 8 years after they divorced. Prokofiev and Stalin coincidentally died on the same date; in the great national mourning for Stalin, the composer’s death was barely even noticed. Scriabin gained fame as a composer and mystic. He believed that his art offered the possibility of showing change on a universal scale. The composer placed little value on traditions and limitations, for this reason. Consequently, the public labeled him as either an innovator or an eccentric – or possibly a madman. His synesthetic experiments in projecting colors that reflect musical tonality have proven almost impossible to perform, even in our own time. He was the first to use color-music, believing that sound has the capability to change reality. He even planned a composition intended to cause the onset of the Apocalypse. He toured widely as a famous concert pianist. He died unexpectedly of a blood infection, at the age of 43. This famous Russian-born composer came from a German-Jewish family, and Russian was his second language. The first musical instrument he learned was the mouth-organ. His characteristic compositional approach was a synthesis of many different styles – “polystylization,” as he called it. Some fans were enthused by Schnittke’s inclusion of electric and bass guitars in orchestral works. Schnittke claimed that he did not compose music, but simply wrote down what came to him from on high. Like many 20th-century composers, he also wrote film soundtracks and even music for cartoons. His final eight years were spent in Hamburg, Germany – but his body was returned to Moscow for burial.